ISTJs have a steady, focused determination to do what they believe is important. You don’t flinch when roadblocks get in the way of your plans, instead you search carefully for ways to circumvent problems. In the words of ISTJ Elizabeth Holmes, “I keep my head down and focus on what I’m doing. Big waves come and go, but I’m there for a reason.” You have a talent for pausing and considering before rushing headlong into ideas that might be a waste of time. But once you do commit to a plan or idea, your dedication unrivaled. You can teach the world that steady, consistent willpower can help anyone to achieve their goals. ISFJs are very attentive to the practical needs and concerns of others. You believe in improving your community and you have a heart for those who are struggling to get by. Being attentive to the hurts and labors of others is a gift, and you are diligent in finding tangible, hands-on ways to provide relief. In the words of ISFJ Mother Teresa, “I have found the paradox, that if you love until it hurts, there can be no more hurt, only more love.” You can teach the world that accumulating possessions isn’t what brings joy, instead giving is one of the surest pathways to happiness. ESFJs like you are very capable of seeing the needs and struggles of others and finding ways to provide relief and respite. When the ship is sinking and someone is needed to assess the practical and emotional concerns of the travelers, you are a comforting voice in all the chaos. You encourage people to be strong, and you take care of details and find hands-on ways to aid everyone on board. You are good at assessing the emotional atmosphere of the environment and figuring out what needs aren’t being met and prioritizing them in order from greatest to least. Psychologist David Keirsey calls ISTPs like you “The Tactical Crafters” and it’s not hard to see why. You have a precise, hands-on, analytical intelligence and an ability to be resourceful that is second to none. 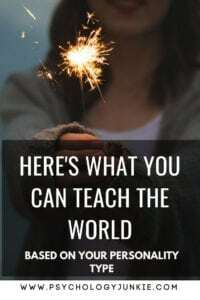 Like the fictional ISTP MacGyver, you teach the world that nothing is truly hopeless. There is always a resource, a tool, or an unexpected way out of any crisis. You show us that we can do a lot with what we have now and we don’t need to waste time always yearning for newer and better things (even if we might enjoy them). Related: What’s Your “Hero” Function? As an ISFP, you see artistry and dimension in everything that surrounds you. You feel a kinship with the plants, animals, sights, sounds, and textures of the world. You believe in honoring nature and the moment for what it is, for people as they are. Instead of wanting to change everything, to impose an idea onto everything, you see how things can be appreciated for what they are inherently. You accept imperfections, see beauty in them, and try to find the joy in the simple pleasures of life and the opportunities to be enjoyed in every moment. As an ESTP you have an optimistic, determined zest for life that is contagious. You teach us that taking smart risks is essential to living fully. You show us that it’s okay to trust our instincts, to respond to adventure, and to immerse ourselves in the moment. Your resourcefulness and tough-mindedness is inspiring and you show us that there’s no better view than the one you get when you’re living life on the edge. Psychologist David Keirsey says of ESFPs, “These expressive Artisans’ primary social interest lies in stimulating those around them, arousing their senses and their pleasurable emotions – charming them, in a sense, to cast off their concerns and lighten up.” ESFPs like you are masters of seeing the humor, the joy, the opportunity in every moment. Your quick wit, clever resourcefulness, and enthusiasm for life is second to none. You teach us how to laugh on our worst days, and how to find the silver lining in the most dire situations. As an ENTP, you look beyond the norm to find new, innovative ways of seeing the world and transforming the future. You see connections, possibilities, and potential everywhere and all you need is the resources to make it happen. You teach us how to ask the right questions, how to brainstorm, and how to think critically about limiting beliefs and practices that get in the way of progress. Psychologist David Keirsey was right when he said, “ENTPs are the most reluctant of all the types to do things in a particular manner just because that is the way things have always been done.” And that’s one of the things we love about you. 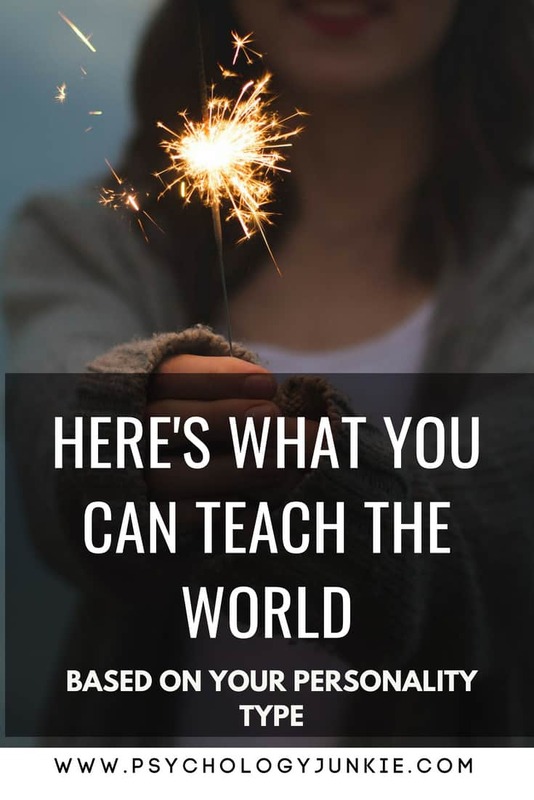 What’s something you’ve been able to teach someone? Do you have a gift you’d like to share with the world? Let us know in the comments!